Did you know around 2000 people get lost in the woods every year? Knowing how to start a survival fire and prepare a shelter in cases of emergency could help save your life. Hiking and rock climbing are exhilarating activities. They help our bodies feel reinvigorated and inspired by the natural wonders. However, like all activities, they can be dangerous, especially if you don’t prepare beforehand. The best way to keep you and your company safe is to take preventative measures. This means letting people know where you are, bringing the right materials, and knowing what to do in emergencies. Knowing how to make a survival fire in many different situations is a very valuable and important skill. Here are 10 steps that will help you create a fire when you are stranded alone in the woods. The very first step is to choose the right location for your fire. Before you determine the location, you should make sure that you have both water and shelter. These are much more important when talking about survival unless you are in an icy and frigid area without proper winter gear. The water will also be helpful in case you ever need to put out the fire quickly. Once you have established a safe shelter near water, you can begin looking for the ideal fire pit spot. It should be on dry ground with a relatively flat surface. You should also choose an area that is protected from the wind. This will make it easier for you to start the survival fire and maintain it. Not only that but it will also decrease the risk of the fire getting out of control in a dry environment. In fact, nearly 90% of forest fires are caused by people being negligent maintaining and creating a campfire. If you are stranded in the woods you have enough problems already without adding a raging forest fire to the mix. A large boulder or rock often creates a good wind buffer. You’ll also want to choose a location that is close to firewood. That will help you to maintain the survival fire without having to search very far for new wood and risk getting even more lost. The next step is to create a pit for your survival fire. First, you’ll want to clear out any debris and leaves. Once you have a clean area, dig out a shallow pit and line it with rocks. This helps stop the coals from spreading too far and help the fire last longer. Next, it’s time to start collecting your firewood and kindling. The key to being able to start a fire is choosing the right materials and having enough on hand. Plus the dryer it is the better, did you get that? The dryer the better, moisture is your enemy here. Tinder is the finer and most flammable substance. It can be things such as pine needles, cardboard, steel wool, etc. It burns fast and easy. This is what you will use to start your survival fire. However, because it burns so fast you’ll need a lot of it, especially if you are a beginner. Once you get a spark to catch with your tinder you’ll want to start trying to transfer that flame to your kindling. Kindling is small to medium sized sticks. You’ll want to start with the smallest twigs and slowly move to your larger sticks as the fire grows. Once your survival fire has grown to a sizeable flame, you can slowly add your fuel, which is bigger logs and branches. Be careful when adding a lot of fresh wood because it can actually suffocate your fire. Always make sure that the wood and kindling that you are using is dry. Wet wood is great for making a lot of smoke but it won’t help your fire get started. If you want to send a smoke signal, make sure you have a strong enough fire that can withstand wet wood being added to it. The next step after you collect your wood and kindling is to determine how you plan to start your fire. This can be the most difficult part, especially if you don’t have standard survival tools like matches or a pocket knife. However, it’s still possible to start a survival fire without any of these materials. Here are a couple of ways that you can start a fire without matches. First, you can try to start a fire using friction. Friction fires refer to rubbing two objects together fast enough and long enough to convert kinetic energy into thermal energy. There are a couple of different ways to do this. The first way is called the fire plow, this method of fire lighting has been around since primitive times. For this method, you need to find a flat plank style of wood. Then either create a groove in the middle or find a piece of wood with one already there. This groove will help you to concentrate your efforts on heating up one area. Pick a stick that fits in the groove. Then push the stick down and back up it as fast as you can. Be sure to have a pile of kindling at the bottom of the plank to catch any falling embers. Once you have a spark start slowly and softly blowing on it until you get a flame. Some have found this method easiest when they kneel and put the wood on their legs. There are two types of drill method friction fires, the hand drill, and the bow drill. Both involve the same concept. For the drill method, you want to find a flat plank of wood. Cut a small V-shaped knob in it. Cut a similar shape on the other side so that there is just a small hole. Place your kindling on the underside. The next step is to find a stick that fits pretty snug into the hole. If you can cut off some of the bark at the end of the stick that’s ideal. With the hand drill method, you will use your hands to spin the stick as fast as you can and as long as you can until you begin to see smoke coming from the kindling. The kindling can then be nurtured into a small flame and eventually a survival fire. The bow drill option is a little bit easier. Instead of only using your hands, you can create a bow using a green stick and your shoelaces. You can then use the bow to help spin the stick using only one hand. This will help you from getting as tired. The next method involves utilizing the power of the sun. This obviously won’t work unless it is daytime. In fact, it’s best to try this method when the sun is strongest, around noon. In order to use the sun, you need a reflective or translucent material. Things that work great with this are ice, mirrors, magnifying glasses, etc. The point is to concentrate a little bit of sunlight onto one area of your kindling. This will heat up the material to the point where it starts to either smoke or if you’re lucky creates a small flame. The key point of this method is to make sure that you are holding the concentrated light steady and in one spot. If you have shaky hands it might be best if you prop yourself up on something. Otherwise, the energy won’t be able to culminate in a flame. Many times camping cookware sets and other materials have reflective pieces that you can use. Crisco cans are especially great for survival purposes as they can be used as a candle or a fire starter. Another useful technique is to use your car or other batteries. The average person touches or uses their phone over 2,500 times a day. While most of the time we think you should enjoy nature without the distraction of technology, in survival circumstances it could save you. Even if you don’t have service, a cell phone is a great camping tool. You can utilize the battery to create a survival fire. However, with this technique, you’ll need steel wool as well. 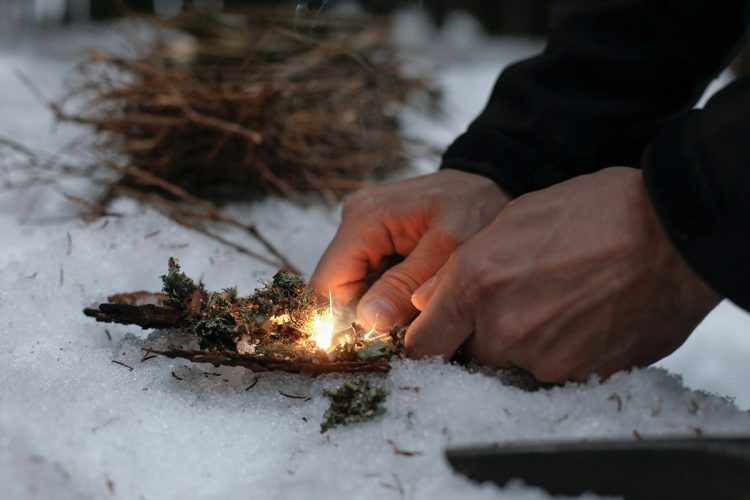 Create a nest of small sticks, twigs, pine, needles and other flammable kindling. Then in the middle of it, put in your steel wool. It works best if you separate the wool a little so more air can pass through it. Then take your cell phone battery out of your phone. Rub the input and output end against the steel wool. This will allow the electricity to flow through the wool and will help it catch fire. Once it does, softly blow into it and use the surrounding kindling as a cushioning. The flames should start fairly quickly. If you are lucky enough to have flammable chemicals with you then you can start fires in a much faster way. Did you know that when brake fluid is mixed with chlorine powder it combusts? Be sure to add these two substances to your survival kit and you’ll have a fire in no time! If you have other flammable materials you can add them to your kindling and they will help keep a spark from going out. Lastly is flint and steel. This is another method where you need some specific materials to get it to work. However, flint and steel are very common camping materials and can even be put on keychains, so you might just have it stored away in your premade bug out bags! When using flint and steel to make a survival fire you need to go through all of the preliminary steps like you did with a friction fire. Once you have a small pile of kindling set up, you’ll want to shave some of the flint onto it. Then you can use either a pocket knife or some other sharp metal piece to hit the steel. This will create sparks. The trick is getting the sparks to land on the flint and start the flame. In order to achieve this, you’ll need to keep the steel low and close the kindling. Otherwise, the sparks will die out before they even hit the patch. If you are having trouble getting the fire started, add more flint. You don’t need to worry about being conservative when you are making a survival fire. Starting a survival fire can be stressful especially when you are lost, scared, and alone. However, it’s important to remember that all it takes is one spark to hit at the right moment. Once you have that spark and smoke, you still need to be patient. Blowing too fast or too hard will cool it down and then you’ll have to start all of over. Let your fire grow naturally and slowly, and before you know it you’ll have a big enough flame to attract search and rescue. A survival fire is crucial for many different reasons. It helps let people know where you are, keeps bugs and other dangerous animals away, keeps you warm, and even helps sanitize food and water. While your body can last up to three weeks without food, you need clean water in order to last just a couple of days, especially when it’s hot outside and you’ve been hiking. So the next time you are planning a new venture out in the woods make sure you go prepared. Bring emergency kits, food, water, fire starters, and whatever else you might need for the trip. While it might seem like a hassle, being prepared will make the trip much more enjoyable. Before you go check out our 5 essential camping safety tips. Have a great trip!